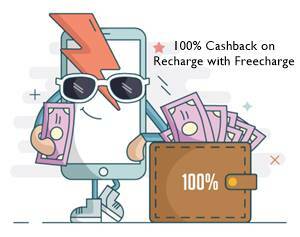 Under Paytm Lakhpati Offer, get a chance to win cashback worth Rs 1 lac every week on recharge or bill payment of Rs.10+ @ Paytm. Paytm brought up Har Din Lakhpati Offer under which you can win 1 lac cashback, two lucky winners in Every week on recharge/bill payment of Rs 10+. 2 lucky winners will be awarded 1 lakh rupees each every week.. Make maximum transactions and use more Paytm services to make chances higher. Customers should do as many transactions of as much value as possible. Customers can pay DTH, Prepaid Recharge, Electricity Bill, Mobile Postpaid Bill, Water Bill, Datacard, and Landline. Winners will be announced within 48 hours on a daily basis. KYC process will need to be completed; once winners are announced. Paytm has the right to disqualify any transaction from participation in this contest. 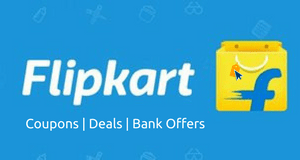 First of all, initiate recharge/bill payment of Rs.10+ at paytm. Apply promo code given on top. Pay the amount using wallet/ cc/ dc/ net banking. 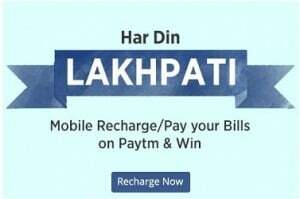 Recharges and bill payments done until 30 September 2017 will be considered for Paytm Lakhpati Offer. There was no contest on that day possibly. This offer has been expired from 17th. how to find my transction id??? and how to work this offers? Go to your recharge history and find ID for each transaction. Sir, how can we know only showing transaction Id that really anyone wons the 1 lac rs.??? pl. provide full details of the winner…..
It’s easy as name can be of multiple persons but ID is unique. I am not able to use your code while paying my electricity bill. Getting error message” use valid/promotional code”. However I can use this code with mobile recharge, dth recharge. But not in case of paying electricity bill (Tata Power – Mumbai). Can you please check? Can anyone revert on my query? I hope this contest is still going.. Simply go to transaction history, and match yours. 21 july ka result kab aayega? when 20th july result published? i make 5 to 10 transaction everyday using LAKHPATI code from 1 month.minimum 1000rs transaction done by this code everyday but i did not win any one of that day. told me anyone win 1lack from you???? i think its scam.paytm make fake offer. No, it’s for users doing maximum transaction and highest on a day. Thanks for your nice officer and get more useful offers to me. 15/16 july ka result kab publish hoga?? It is compulsory to do more then 1 transaction a day to win. When publishing winner list on 14 july 2016? Sir, who is the winner on 14th july? I do not believe this, PayTM should show full name of winners with photos. Is it true….Anybody is there who won the money..actually I have doubt that it’s really work..
can there is any chance for the person who just have done single recharge. or is it compulsory to do maximum number of recharges to win???? Terms are mentioned clearly, please read before commenting. We have already listed till 2nd July. You can match the Transaction ID. would we be eligible for the same contest if we pay by credit card? when u announce 23 july winner, i m eagerly waiting . I was paid the mobile bill on 21st June with this code.When you will be announce the draw? Hi ..when you are going Announce for 20th Winner..
when u announce 13 june winner, i m eagerly waiting . and also give me a little brief for ur draw system. Is It a Lucky draw or winner will be a most recharge doing people? This code is also works with below rs. 100 transaction. So try your luck for any amount transaction. There is no limits on max, you can read the terms again. Plz tell me 13 may and 15 may winner name sir when it’s announced. It’s not possible as 16th is not yet complete. Who is winner of paytm lakhpati contest dated 13 and 14 may 2016.
i am not receive any update about this offer. Pls tell me may 2nd winners list. 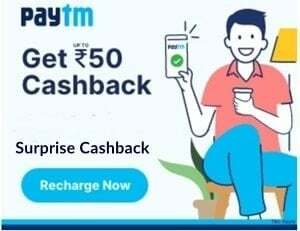 Best offer zone is yours paytm.. .. wh re ! Sir, Who lakhpati winner on 30 april ? It’s not yet declared, stay tuned. Great contest (best) ended successfully. We recommend using mentioned terms. You have to self check and process details are already shared. But if you will do with Rs.50 and it doesn’t comply with terms you will be disqualified. Sir April 13,Apr 14winner list when coming waiting for that. We are expecting on Monday. Did the winners received the cash as cash back in their wallet? Need to complete KYC documentation first. Sir where are the april 13,14,15,16 winners? Excellent work PCC a page for lakhpati contest superb stuff. who is the 13 April winner ??? ?